September 7, 2016 July 26, 2016 / J.K.
Level – Short, easy, requires some familiarity with fly fishing. It is hard to summarize this book. Basically it’s just a guy writing a few short essays/stories, roughly grouped together in broad categories. It is a pre-internet blog, edited and published, roughly 30 years ago. Categories include things like: Bass Pond, Fly Collection, Cane Rods, Adams Hatch, etc. Gierach is an entertaining writer, who tells good stories and does so humorously. As a writer, he is essentially a full time fisherman/fly-tier and therefor seemingly has more good stories than I feel I will have in a lifetime. 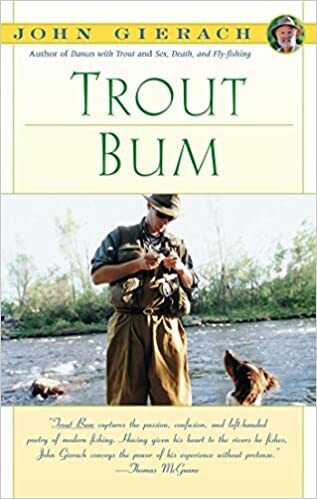 Anyone who has spent at least a moderate amount of time fly-fishing will enjoy this book, especially as he gives the types of people to avoid a fishing trip with or how to make the best camp coffee. If you’ve never fished or don’t intend to again, I’m not sure why you bought this book, but I doubt you’ll like it. Any other fishermen, fly-tiers, maybe even just people who great enjoy the outdoors and like well written, funny stories, this is a book you should put on your list.